Our gardens provide spaces to grow. The grounding effects of our closeness to the bare earth helps to neutralise tensions and the feel of the soil can lift our mood. The warm sun is a welcome treat , as is the gentle breeze or refreshing, light rain on the face. I think our cycling trips can remind us of this as well as enjoying the ride. The sounds we focus on are different in our gardens and all of these elements support, briefly, our ability to push away thoughts of negative influences in our daily life and really feel restored and renewed; more peaceful and happy. We leave the rest of the world at the garden gate and feel the benefit of making time for ourselves, as we focus on the amazing treats nature has for us to notice and enjoy. To sit and focus our senses on what we feel within our garden brings calm and an inner smile. Our senses experience something different from daily life and the feelings we’re left with can be all we need to go back out there and face the rest of the world. You notice, then, how trapped in negative thinking those around us can be and how self-limiting this is – and how we’ve all been there, too. We’ve had a reminder of what really matters – and that’s how we feel. We can choose which influences to allow or not allow in – and in knowing that, we grow. 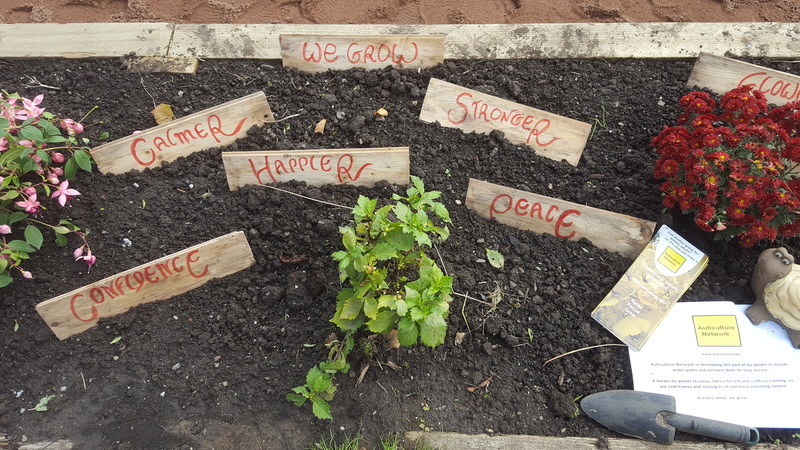 This entry was posted in 2017 and tagged Autism, Feelings, Glasgow, Growing, Nature, Self-Management, Senses. Bookmark the permalink.